I attended the most divinely wonderful yoga class this morning with one of my favorite teachers. She teaches every Sunday morning at 10:00 am and I try my best to attend her class every week. It sets the tone for the week ahead, allowing me to enter more peaceful, grounded and content. More gentle and accepting too. I have noticed there is even a variance in blood sugars (much higher, less stable) for the entire week the times in the past I missed her uniquely healing class on Sunday morning. During class today, my eyes welled up with tears at one point, it just felt so healing– the movement, the postures and meditation. When I told her after class about my tears she said that “emotion is energy that is released.” The unexpected release happened during a meditation and visualization of the area surrounding the heart – perfect! (and much needed…). When I got home I took time to prepare a healthy meal. I decided to eat my lunch outside on the patio to enjoy the beautiful 81 degree summer weather and healing breeze. My meal was the perfect nourishment after such a wonderful morning of yoga: an abundance of organically grown vegetables and fruit (with locally grown cucumber – my favorite!!! 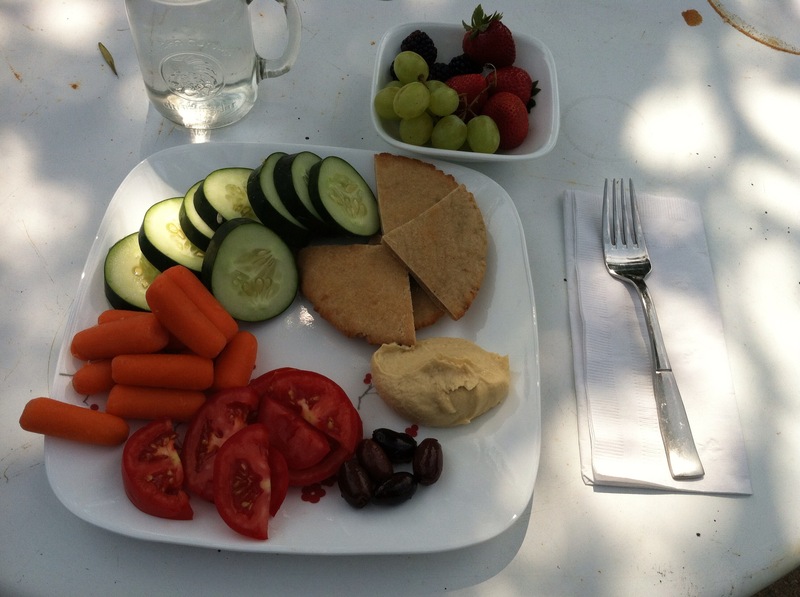 ), locally made hummus tahini, gluten free pita bread and Kalamata olives. One of the many reasons I love summer so much is because of the wide variety of delicious fruits and vegetables available to eat, many locally grown which are the best! The yummy organic vegetables & fruit: baby carrots, cucumber, tomato, green grapes, strawberries & blackberries! I’m now about to get started on my next DiabeticLifestyle article – there is an article due each week. I think I’ll try sitting outside while I write – something I don’t do often enough. As summer is winding down, it is important to me that I spend as much time outdoors as possible. As a Minnesotan who experiences really long, snowy and cold winters – summer is an important time to soak it all in and really enjoy it. Attending church is another healing part of my Sunday, especially for my spirit. It really gives me the grace and strength needed to deal with the complexity and demanding nature of my diabetes and other chronic health conditions I live with. I am thankful that my church has a Sunday evening service at 5:00 pm which allows me to attend yoga class Sunday mornings. What are you doing today to restore and replenish your spirit? Can you set aside your to-do list even for a few hours to spend time doing something you love? Sunday is a great day to slow down and take some time for yourself. Your mind, body and spirit (including your blood sugars!) will thank you! ps. I read Sweet Invisible Body many years ago! I hope you enjoy it – it’s been so long I cannot quite remember what I thought of it. I too love yoga for the great energy and positive mentality it manifests in me like a soft, powerful glow. Being in the right mental place is key to getting thru difficult diabetic days. My recent change to a modified Primal (Paleo) low-carb, high protein, low- glycemic index diet has left me feeling better than I have in over a decade! It’s so important that we take the time to invest in our over-all well-being and mindset! For we will never live freely unless we think so! Come visit us out here in SD! We have daily farmer’s markets happening daily/year-round in different sections of the city with a fantastic selection! Cheers to you; a radiant sunbeam in the diabetes community!